How Are Serotonin, Nausea, and Bowel Movements Linked? Why do mushrooms cause upset stomach? Mushrooms teach us all some of the most important affecting lessons if we are truly listening to the Mycelium Intelligence. 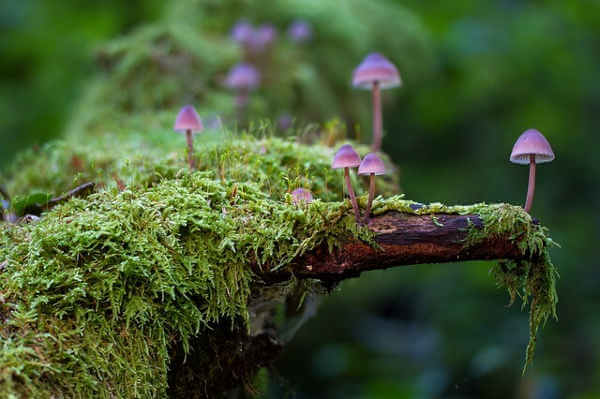 After having consumed more than a few kilograms during the course of my life, and having been on hundreds of mushrooms journeys, here are three of the most important lessons that the mushroom has taught me about itself. The primary chemical in Magic Mushrooms responsible for hallucinogenic and entheogenic activity is Psilocybin which is a Serotonin analog. Serotonin is produced in the brain and the intestines. Most of the serotonin in the body (roughly 80-90%) can be found in the gastrointestinal tract. The next highest concentration is in the muscular system, blood platelets, and finally the brain. It is wise to have an empty stomach before taking serotonergic agonists such as psychedelic tryptamines. Don’t eat anything for 6-8 hours prior to the journey. The reason is elementary: Psilocybin is a potent serotonergic agonist which causes strong gastric activity. Since serotonin is primarily located in the gastric system, when you take mushrooms the gut pretty much wants to expel what it contains since it is being highly agonized. This can cause some people to become nauseated and many people have reported nausea and or having to go to the restroom after taking a moderate dose. Serotonin is primarly produced and used by the gastric system. Serotonin and our gastric systems are deeply linked. Most of our nervous system functions on serotonin. Serotonin is most abundantly found in the gastrointestinal tract. The function of serotonin there is to regulate bowel movements. Higher doses of mushrooms cause a greater effect in the gut. I’ve discovered that Psilocybin mushrooms work best when taken on an empty stomach. Upon the ingestion of anything slightly toxic, the gut begins to produce more serotonin. When the gut is irritated, more serotonin is produced which causes the gut to expel what it contains. “Selective serotonin 5-HT3 receptor antagonists have proven safe and effective for the management of postoperative nausea and vomiting.” This is why serotonin angtagonists are prescribed for severe or deblitating nausea and some gastric issues. Because of the activity of serotonin in the gut, the gut has come to be known as the second brain of the body. This is another symbolic reason why it is important to empty that second “brain or mind” before we ingest magic mushrooms. Otherwise, the gut will try to expel what it contains either through vomiting or through a bowel movement. It is not necessary to fast, but it can be helpful. It is important to keep the stomach empty for at least 6-8 hours before taking mushrooms. When observing various forms of shamanism in the world through my travels, what is most notable to me at the core of it all is Ecstacy. What is it? Ecstasy is a labyrinthine emotion encompassing aspects of pleasure and pain, felicity and elation, triumph and terror, sorrow and empathy, surrender and submission. It is not a sole emotion but everything realized as the whole in the present moment. Shamanism is Ecstasy. Pure. Simple. Untainted by desire. Untainted by sentimentality. Untainted by thought. It is the ultimate act of surrenderous submission that truly substantiates and authenticates the Primal Self and that which is submitted to; the mystery of existence, abandoning into the present moment and experiencing the depths of the Atma, the Soul, the Self, the Universe, and all of existence in the very literal sense. Our bodies dance with the Serpents of the Quantum Fields, waves, moving, slithering, and intertwining. At the heart of this mandalic dance of the Serpents is yourself, intoxicated on herbs of the Gaian Eden, singing, chanting and swaying in the breeze with the ancestral spirits, dancing, moving, slithering, worshipping, fusing into the surroundings and being one with all that is, was and could ever be, experiencing pure ecstasy, abandonment to the moment, disentanglement of being, and invoking a Universality of consciousness; a living and breathing enigma that exists within the body. When I feel overwhelmed by the mushrooms, I chant mantras and sing to Lord Shiva, the God of Psychedelic Ecstasy. I dance to the destruction of the consciousness, which is the “known”, in the greatest dance of the Mahadev Shiv, the Tandav. I sing. I sway side to side. I am lost within myself in the “Wholeness of Being” as the “Ending of the Known” begins. My concern isn’t to have company or my friends. I am uninterested in worldly entertainment. The prime focus of the activity of the mind is on the induction of Shamanic Ecstasy. Every shaman, sadhu, and Malang has his own time honored methods of this ritualistic induction of The Other. These Arcane Techniques of Ecstasy are employed by the Masters of Primacy and the Technicians of the Sacred. In the Psychedelic Sacred Space, it’s realized that the psychedelic experience of the unvarying of space is a primeval enterprise, coalesced to the birthing of the Cosmic Reality. This is the break affected in spacetime that allows the world to be established to a fixed point of orientation. The profane nature of time and matter is an infinite homologous stretch, in which no referential point could be established. The manifestation of the sacred reality in any hierophany reveals a fixed point of orientation of an absolute dimensionality, as opposed to the fleeting reality of the profane. It is through these ritualistic practices of the ancient doctors of ecstasy that the totality of the experience can be allowed to manifest itself as the Ganz Andere, the Wholly and Holy other. Holy has its roots in the ancient Anglo-Saxon word Hale which means complete and whole, unfragmented and existing in union with everything. I’ve consumed larger than heroic doses of mushrooms as well as mixing them with other psychedelics, and I’ve feared for my life a fair few times. I’ve felt terrible anxiety and despair as well. I’ve always found that the cannabis flower, imbued with the spirit of the God of Cannabis Lord Shiva, the God of Psychedelics, the God of Gods Mahadev Shiv, the Shaman of Shamans, the Adhiyogi, is the greatest guide. The psychedelic molecules are like Exo-suits, a technology that installs around you, giving you powers that let you go into subjective and objective spaces that would dissolve you without the molecules protection. Cannabis is like the steering jets and de-orbiting retro-rockets. By chanting mantras to Shiv Ji, and by consuming cannabis in large quantities, the Shaman of Shamans himself guides you on the journey. When I feel overwhelmed by the experience and feel fear, I consume cannabis. This helps to slow down the temporal sense of the organism, and one can now observe the movement of thought within the mind as it produces the fear. Now I am able to watch with perfect clarity my own fears and anxieties, my despair, my agony, my joy and my happiness. With the wisdom of the cannabis flower imbued with the spirit of Lord Shiva, I can observe waves of “thought” as they move in the field of consciousness. Cannabis brings a certain calmness to the mind. It forces the organism to become aware of breathing, the fundamental awareness. With the awareness of breath comes a calmness within the body and the mind. Make sure to have joints rolled and prepared. I find joins work best as I don’t have to bother with bongs, pipes and other apparatus which could get messy in a deep psychedelic state. Take mushrooms on an empty stomach. Use Cannabis to guide the journey. Action of serotonin on the gastrointestinal tract.